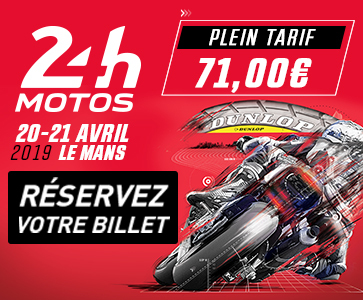 The 24 Heures Motos 2017 is turning out to be the edition that smashes all previous records, including distance and lap time. Team SRC Kawasaki once again took the lead at the warm up this morning, ahead of GMT94 Yamaha and YART Yamaha Official EWC Team. Spectators and competing teams at the 24 Heures Motos paid a vibrant homage to the Suzuki Endurance Racing Team rider Anthony Delhalle, who lost his life at the Nogaro track in early March. A Kawasaki SRC Replica up for grabs on the website L’Equipe.fr was handed over to its thrilled new owner a few minutes before the start of the 24 Heures Motos. YART Yamaha Official EWC Team is currently the lone leader after a crash slowed down Team SRC Kawasaki. GMT94 Yamaha and Suzuki Endurance Racing Team are taking it in turns to chase following an eventful start to the race. The Superstocks are proving unstoppable. Six hours into the race, 11 of the machines in this class are among the Top 20. YART Yamaha Official EWC Team is still in the lead, with GMT94 Yamaha close behind. Team SRC Kawasaki is back in 3rd place 8 hours into the race, while Suzuki Endurance Racing Team has lost ground after running off the track a couple of times. Twenty-six teams will be competing for the EWC Dunlop Independent Trophy at the 24 Heures Motos. On Sunday, €30,000 worth of prize money will be shared out among the first fifteen Dunlop-shod privateers past the finish line. Team SRC Kawasaki, the winner of the 2016 edition, took back control, and will start the 24 Heures Motos from pole position tomorrow thanks to a new record set by Randy de Puniet.